During our recent stay in the Malverns we had the opportunity to explore the many abbeys in the area, all works of art in themselves! 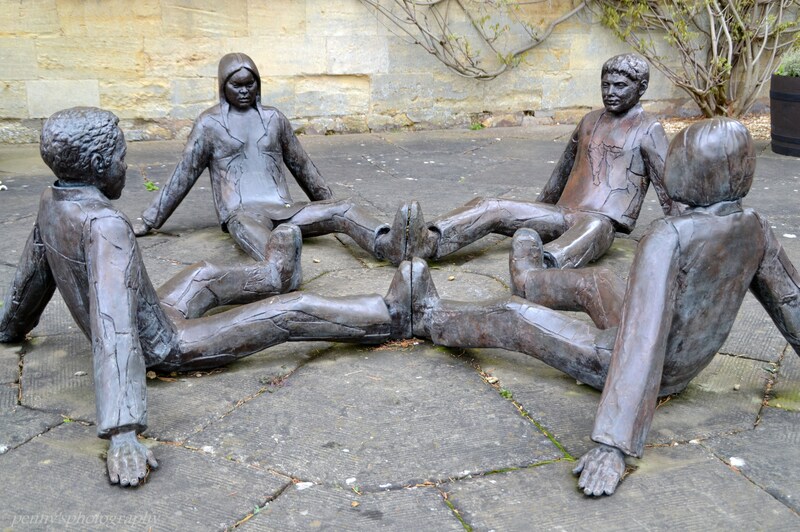 As we left the grounds of Tewkesbury Abbey we came across this sculpture at the front, placed outside the ‘Touching Souls’ tea room in the visitor centre, run by volunteers keeping up the tradition of Benedictine hospitality as shown by the original abbey community. My granddaughter loved the life size sculptures, running around them and eventually sitting on the lap of the ‘girl’ at the back of the group. It was my son who worked out the double meaning of ‘touching souls’ that the arrangement represents….. it took me a while but eventually I understood too! You’ll probably get there quicker than I did – I’m always the last to work out the punchline of a joke! Tewkesbury Abbey is on my list of places to photograph – but I’ll keep an eye out for this sculpture! I found plenty to keep my camera happy there!